Not much to say. 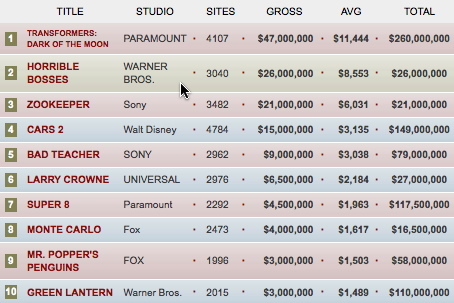 “Super 8” had another good drop, while Woody Allen fell out of the top 10, but continues to chase himself (he’ll be on the heels of “Hannah and Her Sisters” next week). And finally something takes “The Hangover: Part II” off the top of the domestic chart this year. Horrible Bosses (which actually made $28 million) was funny as hell. Glad to see it doing so well. Any idea IF and/or when Tree of Life is going wide, and if so … how wide? 500, 600, 800, etc.. This is sad. Aww Midnight in Paris appearing on these lists was so refreshing. According to Fox Searchlight, The Tree of Life was supposed to go wide this past Friday. As good and funny as Horrible Bosses and Bridesmaids were, word on the street is that 30 Minutes or Less is going to be the comedy of the summer. Glad to see that R-rated comedies are thriving. I have seen all 3 movies and I wish I could tell you it’s true but unfortunately 30 Minutes of Less is nowhere near as funny as the other two. From what I understand, The Tree of Life wide release was pulled because it was starting to fizzle out, and the reality that a mixed reaction in major cities would be even more sour in less cosmopolitan areas. James, I heard similar. But does that mean that it’s never going to have more than 200+? With “Midnight in Paris” and “Bridesmades”gone, I now haven’ t seen any of the films in the Top Ten…not that any of them sound particularly interesting. Shame that “Bosses” didn’t have a healthier start, though. “Bridesmaids” didn’t either, so I think word of mouth should help it. Potter is sitting at 100% on the tomatometer.